Brooklyn art-rockers Here We Go Magic probably aren’t the first band to give a hitchhiker a lift cruising from venue to venue on tour, but their recent pickup by far wins for Best Mustache — and Best Director of Cry-Baby. 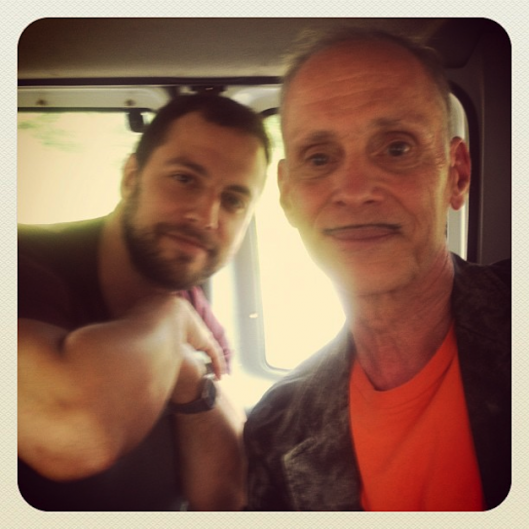 While on the road supporting their latest effort, A Different Ship (which dropped May 2 via Secretly Canadian), the band (more specifically, bassist Jen Turner) tweeted proof that they had indeed picked up director John Waters off the side of the road. According to Bloch and the band’s camp, they and Waters just parted ways, after several educational hours wherein the band became aware of “new words like ‘Trendsexual’ and ‘Blouse. '” He’s not the first legend they’ve encountered, though; they told SPIN earlier this year about that fortuitous time they met Nigel Godrich, which led to his work on Ship.